When I recently brought home donuts, my roommates decided we should fry them. 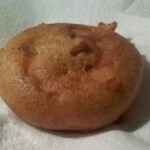 Yes, donuts have already been fried. Double-fried donuts. Om Nom Nom. (You can click on these pics to enlarge them.) 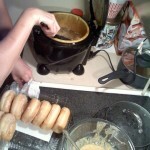 In the first picture: donuts going into the deep frier. 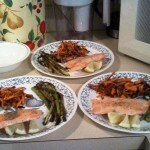 In the third picture, you can see a healthy dinner of baked salmon and sweet potato with sauteed asparagus. Our household prefers more food to less food. So, we would rather have 20 pounds of food in the fridge than 15, because 20 > 15. However, our happiness is not just a function of the pounds of food in our house. We would not want ONLY donuts, even though we like them. We prefer to consume food in combinations. For example, a salmon dinner followed by a double-fried donut. So, we would chose 15 lbs of a mix of foods instead of 20 lbs of just donuts. The principle of convex preferences is an important part of the theory of consumer behavior. The math is explained nicely by wikipedia. This entry was posted in Demand. Bookmark the permalink. Can I simply say what a relief to find somebody that actually knows what they’re talking about online. of your story. I was surprised that you’re not more popular given that you most certainly possess the gift.